It tells the story of the summer in which college student Devin Jones comes to work as a "carny" in small-town North Carolina and has to confront the legacy of a vicious murder, the fate of a dying child, and the way both will change his life forever. It is also a wonderful coming-of-age novel about friendship, loss, and your first heartbreak. 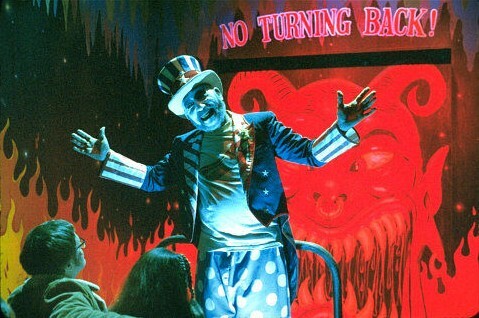 Who dares enter the funhouse of fear? I fell victim to assumption by association with this novel. Without reading the synopsis, I had filed Joyland amongst the other Horror novels I had read on my Goodreads shelves. Approximately 50% through the story (which will be completed before this post is officially made public), and having now read the synopsis, I am fed the realization that an author is capable of leaving the safehaven of the genre that made them. This is not horror; there are no possessed rides, no alien mindgames, no globally devasting disease to wipe out 90% of the population. The last thing I expected when picking up a new Stephen King novel was a bildungsroman, but murder and ghost aside, that is exactly what Joyland is, the coming-of-age of Devin Jones as told by elder Devin Jones. 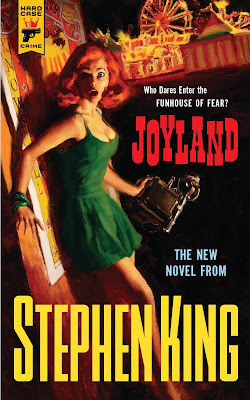 I appreciate the gimmick with Joyland (though I beg other authors to avoid following suit for my own selfish reasonings), wherein Stephen King, who having grown up enjoying the pulp crime paperbacks, decided to give his readers the same feeling of nostalgia. Joyland is set in a small-town amusement park in the 70's, with possibly psychic fortune tellers, quirky characters, mysogyny, and an unsolved crime resulting in a truly haunted house ride. To further achieve the sentiment, King decided that Joyland will only be available in paperback form - no hardcover, no e-book. I've grown to love my e-books (as well as the space and money savings that come with), but the gimmick works for Joyland (King did it, if everyone else could bereave the missed opportunity and skip the copycat gimmickery, that'd be great). Even the cover art to the book is perfect. The story is truly a coming-of-age tale. The Stephen King factor involves a backdrop of creepiness in the possibility of the supernatural, the possibility of danger, the possibility that life and death are more complicated than can be perceived. A large percentage of the book has no real supernatural element and no real antagonist. It is akin to sitting down for a cup of coffee with Mr. Jones to discuss the good old days - when your heart was broken, that one ridiculous job you had, the quirky characters you had to interact with, the strangeness of what you would do for a few bucks over the summer, the friends you made, the older woman, and how you learned to appreciate life. The storytelling style as present-day Devin narrates the tale makes the story flow quickly and ties in all the revelation that experience brings. It isn't until the end where the story becomes Stephen's King-dom. I'll avoid getting spoilery, but the supernatural picks up, the murder case takes center stage, and life and death hang in the balance (but at no point is there that really? moment like when you learned about the cause of the disturbance in Under the Dome). This is what Stephen King does best. He takes well developed characters, ordinary situations, and turns them into something extraordinary. I tend to be more comedic in my writing as well, but it just didn't really show in this one. I actually finished this review and felt it on the weaker side of my ramblings. Joyland just didn't connect to anything else for me, and a big part of my writing is connecting one thing to another. But thank you. Appreciate it. Keep up your book reviews too! Can never have too many places to turn for recommendations! I think I'm going to have to add this one to my 'to read' list after your review. I don't feel like I've read enough King (Carrie, The Shining... I think that's it), and this one sounds pretty good to me. I'm loving the cover too! It's interesting that he chose to just publish it in paperback. In the current age, with e-readers becoming more popular, it's an interesting tactic - but as someone who doesn't particularly enjoy using e-readers, I appreciate it. I don't think Stephen King needs to worry about any loss of sales for people who are all e-reader these days. If anyone could pull off the gimmick, it's him. This was a piece of candy of a read. If you're looking for some more in-depth King, I'd recommend Under the Dome (unless you want to dig back into the older catalogue). But for a quick summer read, this was perfect (especially as a break from the heavier fantasy - I think I'm on my second or third non-fantasy book in a row, which is somewhat odd for me).